Well, here we go again. It was wonderful to have an “off” week. We had lots of visitors. We enjoyed getting out of the house. We met lots of new people. And we got to enjoy our “normal” Scarlett. She laughed, she played, she jumped! She didn’t cry every time we said the word no, didn’t carry a bag of cheese with her, and didn’t have any medications to take. We relished every minute! As great as it was though, we knew that it would come to an end. Or a beginning. So that’s where we are today. The beginning of the next step. Consolidation is a lot of chemo over 56 days. The first week includes a lumbar puncture, a hospital stay and four days of chemo with 4 different meds. Next week is the same without the medication that requires the hospital stay. After 28 days, we start the cycle over again. Confusing? Yes! Intensive? Yes! We also got more information about her bone marrow results. The initial day 15 results show how quickly her body is responding to the chemo. Since these results were clean, that meant that her body was responding well. The day 28 results show how completely her body is responding. Since this result wasn’t clean, it means she will require more chemo. We discussed an initial plan for her treatment today. After consolidation, she will have 7 sessions of cranial radiation over 9 days. T-cell leukemia has a tendency to travel to the brain and spinal fluid and the radiation is an added treatment to prevent that from happening. Stupid t-cell. I guess I was too short sighted to ever see that radiation was in her treatment plan. This scared me today. I cried silent tears while listening to the doctor as horrible images of my baby’s brain being zapped went through my head. I guess I stopped listening to the doctor after that. So tonight I lay in bed with my darling baby, listening to her talk to me like a teenager and I wonder, how will this affect her? Will it affect her learning? Will we ever truly know? There are studies being conducted right now that are looking at whether the radiation is necessary. If more funding was going to pediatric cancer research, these studies may already have an answer and my child may not have to go through this. But, unfortunately, the answer won’t come in time for Scarlett. Once again, Scarlett made it through the day like a trooper. She helped with her blood pressure, temperature, pulse ox, line flushes. She had her port accessed for the first time and wore a mask with no complaints. She charmed the pants off every doctor and nurse that she met. She had a lumbar puncture again with intrathecal methotrexate. She struggled to wake up from sedation (probably the best nap she ever had) but woke right up as soon as they took the trouble to bring her up to the acute care unit. She just wanted to make them work for their money today! And she stubbornly refused to go potty. All day. Until 3:00 this afternoon! We couldn’t start her chemo until she went potty so it was a long day! We finally made it upstairs about 4:00. And that is where we will be until roughly the same time tomorrow. I have such great respect for my Scarlett. She is poised and brave. She doesn’t scare easily. She is going through this with such resilience. She doesn’t have to worry about what tomorrow brings. She doesn’t understand road maps and lab results or remember the name of the chemo agent that makes her really sick. She doesn’t understand the consequences of failing. We will carry that burden for her. Some day I hope that she is able to look back and see how truly brave and strong she really is. 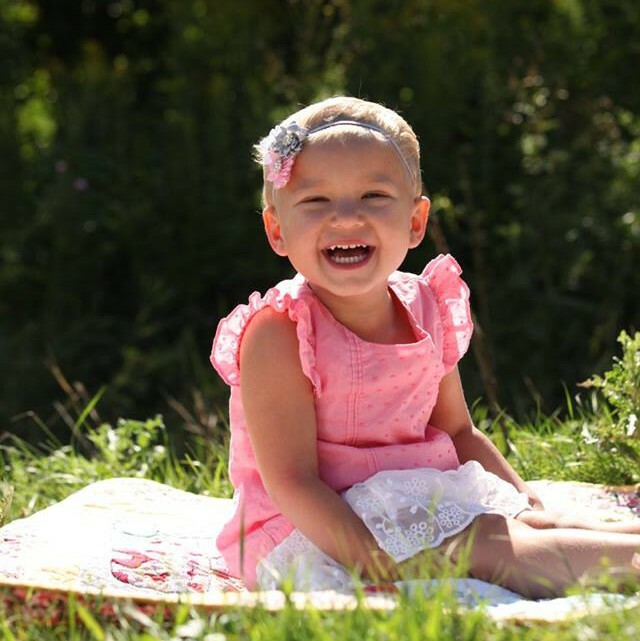 Let this be a lesson for her as a grown up – you were strong enough as a two-year-old to kick cancer, you can be something great! Scarlett, you go, Girl! We are so proud of your strength and courage. What am amazing girl you are. We love you. I can’t wait to have another tea party with you. Next time I will bring cookies, okay?